Thảo luận trong 'Câu lạc bộ Tiếng Anh' bắt đầu bởi Oil Gas Vietnam, 14/3/18. The Japan Bank for International Cooperation (JBIC) is considering funding the Block B&52/97 project of the Vietnam Oil and Gas Group (PetrolVietnam) using loans without a government guarantee. General Director of PetrolVietnam Nguyen Vu Truong Son recently worked with JBIC representatives on financial arrangements for the project. According to PetrolVietnam, the project, worth nearly 10 billion USD, is one of the two largest gas projects in Vietnam. The capital arrangement for the project is one of the main concerns of foreign partners involved in the project. The Block B&52/97 project’s oilfield development report was approved by contractors and the State appraisal council, while its environmental impact assessment report was ratified by the Ministry of Natural Resources and Environment. The quantitative risk assessment report was also submitted to the Ministry of Industry and Trade. As scheduled, the contract will be awarded in June 2018, and the signing of Engineering Procurement Construction and Installation (EPCI) contracts for the project will be performed in July. The Block B&52/97 project includes two sub-projects. The first aims to develop the Block B oilfield, with PetrolVietnam owning the most capital of the project (42.896 percent). 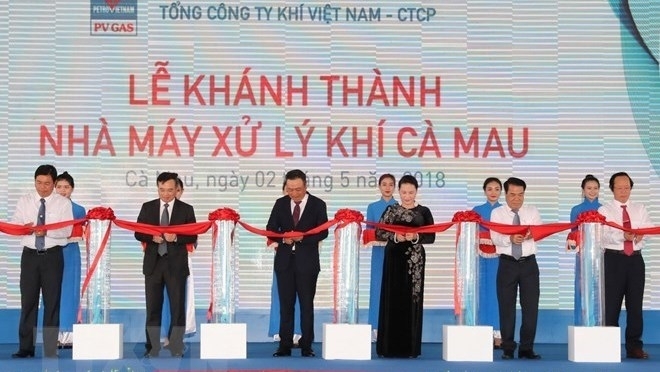 Other investors are the PetroVietnam Exploration and Production Corporation (26.788 percent), the Mitsui Oil Exploration Company (MOECO) of Japan (22.575 percent), and Thailand’s PTT Exploration and Production Public Company Limited (PTTEP) (7.741 percent). The remainder is to build the Block B - O Mon gas pipeline with a total length of 430km. It is invested by PetrolVietnam, PetroVietnam Gas Corporation (PV Gas), MOECO and PTTEP. The Block B&52/97 project is expected to bring ashore 5.06 billion cu.m of gas per year within 20 years, meeting gas demand of power plants in the south.